(D No. 2) Preliminary Sketch of Hatteras Shoals. 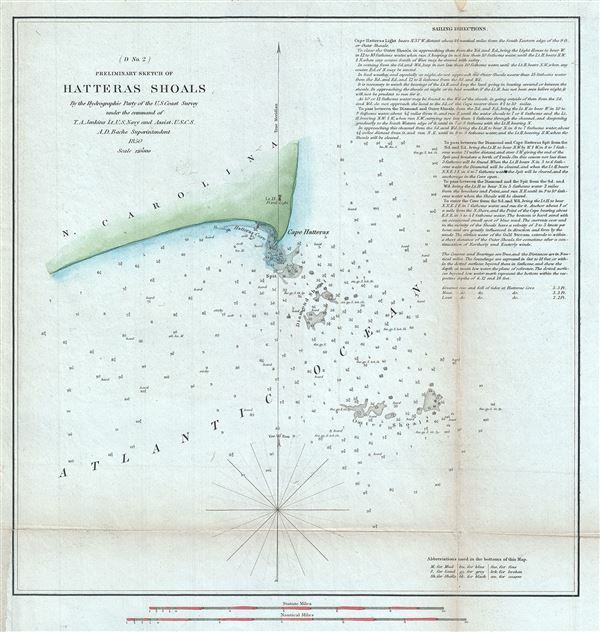 This is a fine example of the 1850 U. S. Coast Survey's nautical chart of Cape Hatteras on the Hatteras Island in North Carolina, and its surrounding shoals. It covers Cape Hatteras and Hatteras Cove and includes Diamond Shoal and the Outer Shoals. The old lighthouse, built in 1803 is noted on this chart. Prepared by T. A. Jenkins under the supervision of A. D. Bache, one of the most influential and prolific Superintendents of the Coast Survey, and issued in the 1850 edition of the Superintendent's Report. Bache, A. D., Report of the Superintendent of the United States Coast Survey, (Washington) 1850. Very good. Some wear and toning on original fold lines. Backed on archival tissue for stability. Minor spotting.